Here are some slabs for sale. Pretty pattern on a nice sized agate slab. Looks like tiny clusters of stars swirling in a clo.. Pretty pattern on a thick agate slab. Looks like amber clouds with tiny clusters of stars ar.. 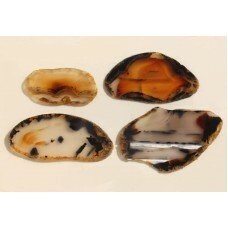 Here is a group of 5 large Apache Tear nodules. Apache Tears are a volcanic glass. They appear bla.. 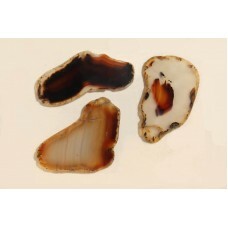 Here is a group of 5 small Apache Tear nodules. Apache Tears are a volcanic glass. They appear black.. Here is a great looking slab of Bark Jasper. It is from Montana. 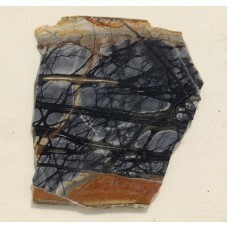 It has great patterns in a nice pur..
Beautiful blue lace agate slab. Great banding on this piece with a new blue color. Size ..
Beautiful blue lace agate on matrix slab. Great banding on this piece. Size is about 1.. This slab of Blue Tiger' s eye is an interesting because it also has hints of Golden Tiger eye color.. This slab of Brecciated Jasper has some nice bright reds along with brick reds against a hint of qua.. This Moss Agate has some great swirling patterns in shades of brown against a translucent white agat..
Beautiful pattern in the piece of brown swirl agate. there is even a small druzy pocket. .. This could be considered a Moss Agate, but the swirls of brown are so thick that there are only a fe.. This is a beautifully patterned slab of Crazy Lace Agate. There are lots of fine fortification lin.. This is a beautifully patterned slab of Crazy Lace Agate. There are lots of fine fortification lines..